Founded in 1998, Ingleby Gallery maintains an ambitious program of exhibitions and off-site projects by established and emerging artists. Over the past 20 years, it has secured a reputation as one of the country’s leading private galleries, renowned for the quality of its exhibitions and publications. In May 2018 Ingleby celebrated its 20th birthday by opening a new gallery in a historic building in central Edinburgh - Olivia's home city. The Glasite Meeting House is an austere but beautiful building dating from 1834, originally built as the Edinburgh headquarters of the Glasites, a breakaway group of Church of Scotland worshippers. The Glasite Meeting House has now been restored and refurbished to create a unique exhibition space; historical in character but wholly contemporary in vision. Olivia was commissioned to create a bespoke series of ceramic for the Feasting Room. Members of the Glasite community used to gather in this room for kale soup during a break in the six hour services. The tables, designed for the space, have ledges for prayer books and around the edge of the walls are pegs for the Elders to hang their hats. 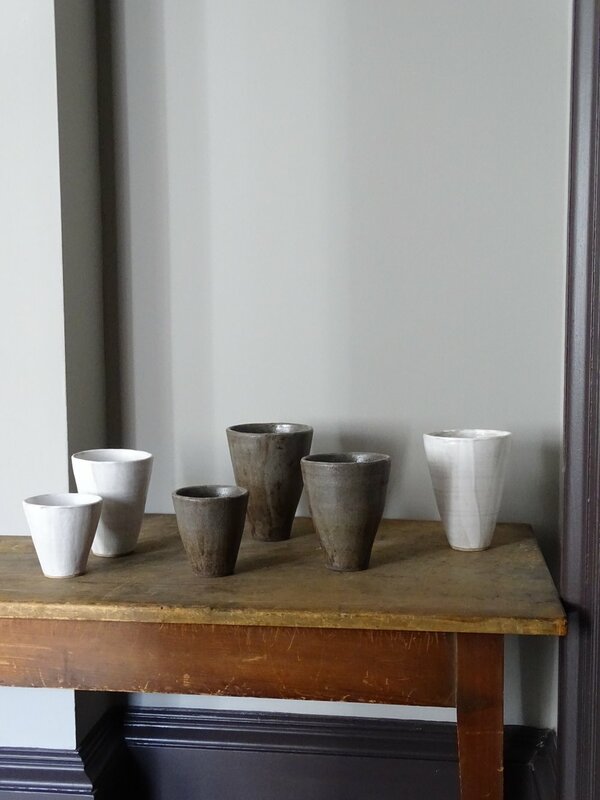 The ceramics include tableware, nesting serving platters and bowls, as well as functional and sculptural vases. The pieces were all carefully hand built in sanded buff and black stoneware. The series is on display and available through Ingleby.